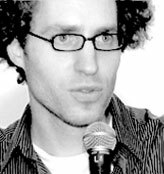 Manuel Schmalstieg (*1976, Berne) operates on the borderline between video, performance and software art. After experimentation in the fields of graphic novel, animation film and audio production, he turns at the end of the nineties towards realtime video. His performances and installations have been showcased at Neue Kunst Halle St-Gallen, Plug.In (Basel), iMAL (Brussels), the National Museum of Skopje and the Bucharest Biennale. From 2004 to 2007, he works as teaching assistant at the university of arts Geneva (ESBA), where he takes part in establishing the new media facility pôle art/media. He has studied at the Universities of Berne and Neuchâtel, the Ecole supérieure des beaux-arts Geneva (ESBA), where he was part of Atelier Zero1 and General Document, and the Academy of fine arts Krakow (ASP), where he attended the animation film studio of Prof. Jerzy Kucia.